How long is the River Walk? The San Antonio River Walk is 15 miles long including the Downtown, Mission and Museum Reaches. How much does a barge ride cost? *Prices are subject to change. Please check with Go Rio for pricing. Where can I get river barge tickets? Tickets for narrated river cruises through Go Rio can be purchased online, or at GO RIO ticket stations on the River Walk. View this map to see ticket booth locations. Do we need to make a reservation for the river barge? Reservations are not necessary for GO RIO’s public narrated cruises. Cruises leave the dock ever 15 minutes. Large groups can call (210) 227-4746 to make a reservation. Where can I catch the river shuttle? You can board the GO RIO River Shuttle at one of 13 designated stops along the River Walk. River Shuttles are marked with signs on the front and back of the barge. Shuttles run on a timed schedule, approximately one hour. How much does it cost to visit the River Walk? Is the River Walk ADA accessible? The River Walk is ADA accessible from some areas. Click here to view a map. Are dogs allowed on the River Walk? Leashed dogs are allowed at the River Walk. Some restaurants allow dogs in outdoor areas, but please call before visiting a specific business. How much does admission to the the Alamo and the San Antonio Missions cost? Admission to the Alamo and the San Antonio Missions is free. What are the hours of the Alamo and the Missions? Do the Alamo and the Missions offer tours? Park Rangers and Docents conduct free tours, staff permitting at the four missions within the park. Contact the Visitors Centers at each of the four missions to inquire about tours. The Alamo offers audio tours in English, Spanish, German, Japanese, and French daily from 9:00 AM – 6:00 PM. Audio tours are $7 per person. Guided tours of the Alamo are available by reservation. Guided tours are $10-$15 per person. Is there parking at San Antonio Missions National Historical Park? Free parking is available at each of the Mission sites. How do I get from Downtown to San Antonio Missions National Historic Park? Driving: Travel south on South St. Mary’s Street. Approximately one mile south of downtown, after passing beneath railroad tracks, South St. Mary’s becomes Roosevelt Ave. Continue on Roosevelt 4 miles to a large stone structure on your left: Mission San José. At the first stop light past the mission turn left onto New Napier Ave. Follow the signs into the parking lot. Public Transportation: The VIVA Missions route (40) by VIA takes you to the historic San Antonio Missions World Heritage Site from Downtown San Antonio. Click here to view the route map. Bike: Swing by a SWell Cycle station to rent a bike to ride the Mission Reach section of the River Walk to the San Antonio Missions. Click here to view a map of the Swell Cycle Stations. See this Map Drive, Bike or Bus to the San Antonio Missions World Heritage Site. Are dogs allowed at San Antonio Missions National Historic Park? Leashed pets are welcome on the grounds of the four missions. They will not be allowed into park buildings or churches. Is San Antonio Missions National Historical Park ADA accessible? Each of the major sites in the park are partially wheelchair accessible. How do I get from Downtown to Pearl? Driving: Take Broadway St. north, and turn left on Pearl Pkwy. River Shuttle: You can get on the GO RIO River Shuttle at one of the 13 designated stops and get off at the Springs Landing Station on the opposite side of the river from Pearl. River Shuttles run on a timed schedule, approximately every hour. Public Transportation: The VIVA Culture Route (11A) route by VIA takes you to Pearl from Downtown San Antonio. Click here to view the route map. Where can I park at Pearl? There is a multilevel parking garage at Isleta & Emma Koehler that usually has space, and is ALWAYS free! There are several surface lots throughout Pearl which are also free to Pearl guests. Insider tip: Try the River West Parking Lot located on E. Elmira between E. Myrtle and Schiller. Are dogs allowed at Pearl? Leashed dogs are allowed at Pearl. Always remember to pick up after your pup! What will the weather be like during my visit? What is the cost of a cab ride from the San Antonio International Airport to Downtown? A cab ride from the airport to Downtown San Antonio costs approximately $23 – $25. In Downtown San Antonio, RVs can be parked at the Travis Park parking meters or at The Alamodome. Arrangements need to be made in advance for both. Which Hotel should I stay in? View San Antonio hotels here. Can you send me printed material to help plan my vacation? 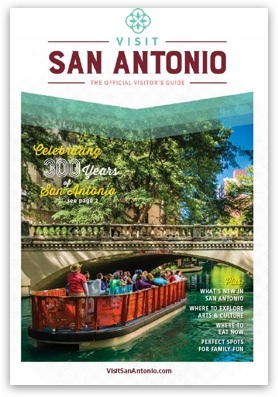 Click here to order a printed Visitor Guide. Click here to view San Antonio discounts and deals. Where is the Visitor Information Center located? The Official Visitor Information Center is located at 317 Alamo Plaza, directly across from The Alamo. Downtown San Antonio has many parking garages, lots, and metered parking options. Most hotels offer valet or self-parking options. When is Fiesta San Antonio? Is there a tour of San Antonio? Click here to view a list of tours & tour companies. Is there public transportation to the museums, theaters, art galleries and the Zoo? The VIVA Culture route (11) takes riders from Downtown San Antonio to many cultural attractions.